Saturday August 31st 1895 I did some baking and did churning this forenoon. Will went to town and to the valley before dinner. He took us girls to town afternoon. I was at Esthers after I got my shopping done. came home to do the evening work. I saw Charlie in town. Ott was nominated for the legislature at the Democratic Convention this afternoon. weather cool and pleasant. Sunday September 1st 1895 We hurried through the morning work and all went for a ride out to Emma Wealdies. found her pretty well. came back another road. Had a fine drive got home at twelve oclock. At two Will and I went over to Woolfs and stopped at home a few momentns. Laura went to the valley to supper with Mr. Metcalf. It has been a pleasant day. Monday September 2nd 1895 Will helped some with the washing and it was done before ten oclock. I then cleaned up the house and got dinner. I ironed all my things in the afternoon. Laura peeled apples to dry. I picked the pickles and got supper. Will was in town in the afternoon. Laura went down with John Stevens in the evening. 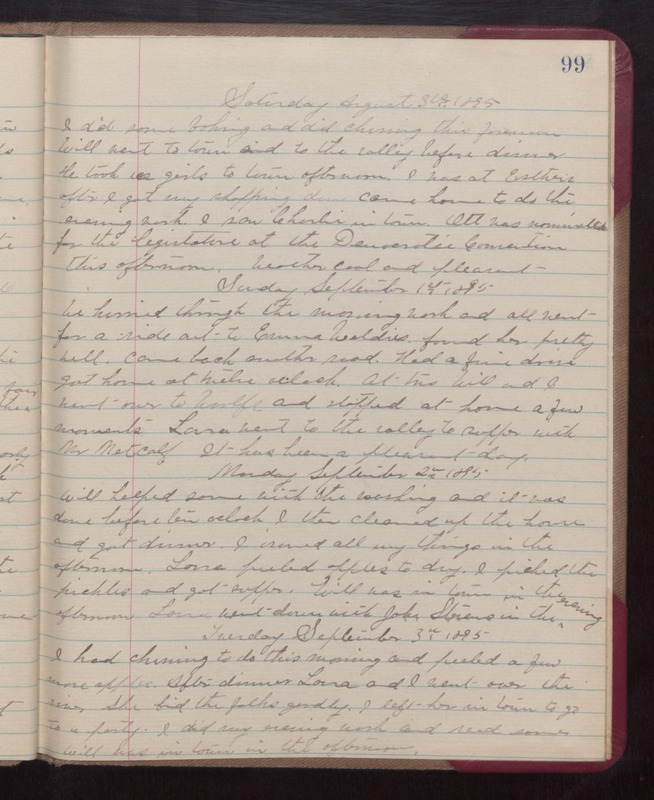 Tuesday September 3rd 1895 I had churning to do this morning and peeled a few more apples. After dinner Laura and I went over the river. She bid the folks goodby. I left her in town to go to a party. I did my evening work and read some. Will was in town in the afternoon.